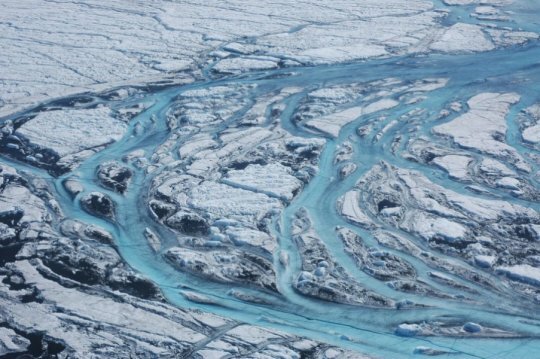 Surface melting across Greenland's mile-thick ice sheet began increasing in the mid-19th century and then ramped up dramatically during the 20th and early 21st centuries, showing no signs of abating, according to new research. Large rivers form on the surface of Greenland each summer, rapidly moving meltwater from the ice sheet to the ocean. Surface melting across Greenland's mile-thick ice sheet began increasing in the mid-19th century and then ramped up dramatically during the 20th and early 21st centuries, showing no signs of abating, according to new research published Dec. 5, 2018, in the journal Nature. The study provides new evidence of the impacts of climate change on Arctic melting and global sea level rise. "Melting of the Greenland Ice Sheet has gone into overdrive. As a result, Greenland melt is adding to sea level more than any time during the last three and a half centuries, if not thousands of years," said Luke Trusel, a glaciologist at Rowan University's School of Earth & Environment and former post-doctoral scholar at Woods Hole Oceanographic Institution, and lead author of the study. "And increasing melt began around the same time as we started altering the atmosphere in the mid-1800s." "From a historical perspective, today's melt rates are off the charts, and this study provides the evidence to prove this" said Sarah Das, a glaciologist at Woods Hole Oceanographic Institution (WHOI) and co-author of the study. "We found a fifty percent increase in total ice sheet meltwater runoff versus the start of the industrial era, and a thirty percent increase since the 20th century alone." Ice loss from Greenland is one of the key drivers of global sea level rise. Icebergs calving into the ocean from the edge of glaciers represent one component of water re-entering the ocean and raising sea levels. But more than half of the ice-sheet water entering the ocean comes from runoff from melted snow and glacial ice atop the ice sheet. The study suggests that if Greenland ice sheet melting continues at "unprecedented rates" -- which the researchers attribute to warmer summers -- it could accelerate the already fast pace of sea level rise. "Rather than increasing steadily as climate warms, Greenland will melt increasingly more and more for every degree of warming. The melting and sea level rise we've observed already will be dwarfed by what may be expected in the future as climate continues to warm," said Trusel. To determine how intensely Greenland ice has melted in past centuries, the research team used a drill the size of a traffic light pole to extract ice cores from the ice sheet itself and an adjacent coastal ice cap, at sites more than 6,000 feet above sea level. The scientists drilled at these elevations to ensure the cores would contain records of past melt intensity, allowing them to extend their records back into the 17th century. During warm summer days in Greenland, melting occurs across much of the ice sheet surface. At lower elevations, where melting is the most intense, meltwater runs off the ice sheet and contributes to sea level rise, but no record of the melt remains. At higher elevations, however, the summer meltwater quickly refreezes from contact with the below-freezing snowpack sitting underneath. This prevents it from escaping the ice sheet in the form of runoff. Instead, it forms distinct icy bands that stack up in layers of densely packed ice over time. The core samples were brought back to ice core labs at the U.S. National Science Foundation Ice Core Facility in Denver, Colo., WHOI in Woods Hole, Mass., Wheaton College in Norton, Mass., and the Desert Research Institute in Reno, Nev. where the scientists measured physical and chemical properties along the cores to determine the thickness and age of the melt layers. Dark bands running horizontally across the cores, like ticks on a ruler, enabled the scientists to visually chronicle the strength of melting at the surface from year to year. Thicker melt layers represented years of higher melting, while thinner sections indicated years with less melting. Combining results from multiple ice cores with observations of melting from satellites and sophisticated climate models, the scientists were able to show that the thickness of the annual melt layers they observed clearly tracked not only how much melting was occurring at the coring sites, but also much more broadly across Greenland. This breakthrough allowed the team to reconstruct meltwater runoff at the lower-elevation edges of the ice sheet -- the areas that contribute to sea level rise.